We manufacture and export Laboratory Testing Equipment using supreme quality material and the advanced technology. These are used in general laboratory, biotechnology/microbiology, pathology, entomology, pharmaceuticals, seed and soil testing, water testing, meteorology food processing. These entire laboratory testing equipment are available at the competitive prices. Environmental Test Chambers simulates extreme environmental conditions, which a product has to withstand during its life span. It is also used to accelerate the effects of exposure to the environment, sometimes at circumstances not really estimated. This product creates perfect conditions for industrial element/product research and Biotechnical requirement test. 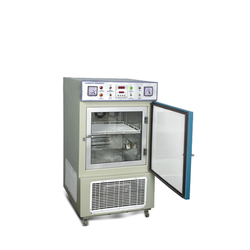 We manufacture a wide range of these environmental test chambers by using the superior quality material in different sizes, shapes, and models as per the client requirement. Low-pressure Boiler to generate steam for chamber humidification. The chamber is provided with modular removable shelves made of S.S. for complete flexibility in use. 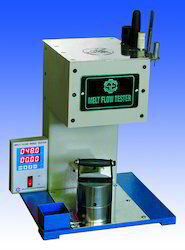 Melt Flow Index instrument measures the rate of extrusion of molten resins through a die of specified length and diameter under prescribed conditions of temperature, load, piston position.